Smart phones change people's life. Everyone can take a picture with a smart phone. In recent years, iPhone has become one of the most popular smart phones. Equipped with high-definition camera, iPhone has been used to record just about every aspect of users' life. Undoubtedly, most iPhone users have lots of photos stored on their iPhone. However, it is not a rare thing that some people accidentally delete some photos and they may find they still need the photos after deleting them. Some people find their photos lost due to various reasons such as software update that doesn't quite go as planned (like updating to iOS 12.1/12), jailbreaking iPhone, or photos just disappear for unknown reasons that are out of your control. 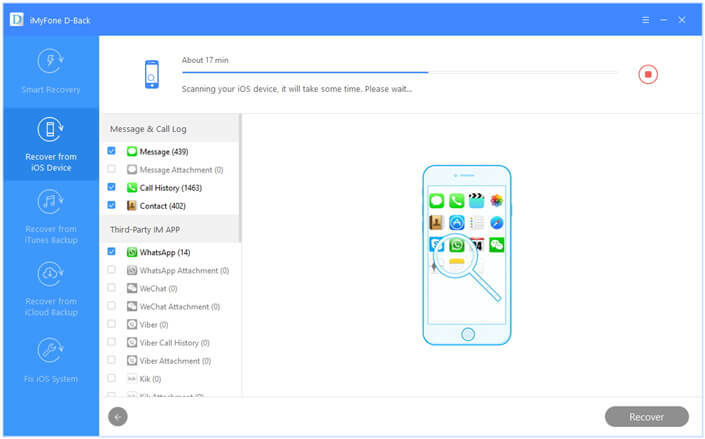 The main purpose of this article is to explain the possible ways to recover the deleted or lost photos on iPhone including iPhone XS/X/8/7/6/5/4, which also applys to the other iOS devices such iPad and iPod touch. 1. Part 1: Can You Recover the Deleted Photos Directly from iPhone? Part 1. Can You Recover the Deleted Photos Directly from iPhone? The answer is YES, but positive results are not 100% guaranteed. To make you understand that, you should first know how your data is stored on iPhone. iPhone saves data on a database called SQLite. If you delete some data, the data is not erased or removed completely from iPhone. It's just marked as "Unallocated" from "Allocated", and it is still on your iPhone. You can consider that it is hidden on your iPhone, so that you are not able to view them anymore. Therefore you need a third-party tool to help you find the deleted data and make the data visible for you. However the deleted data will not always be stored on your iPhone. Once you create new data, these data will be occupied or replaced firstly. In another word, these data might be overwritten when you create new data. Any operation of your iPhone will lead the deleted data to be unrecoverable. There are 3 things you should know to maximize the chance of recovering the missing photos. First of all, stop using the iPhone right away. This reduce the possibility that the deleted data you are trying to recover gets overwritten. Secondly, we have to remind you that data deleted via factory resetting are very hard to recover. Factory resetting is different from normal deletion. The data will be completely erased. Compared with other data types like text messages, notes, it is harder to recover media files because the structure of such data is more complicated. Now I would like to introduce 4 methods to recover deleted photos on iPhone. You can choose the best one according to your own situation. 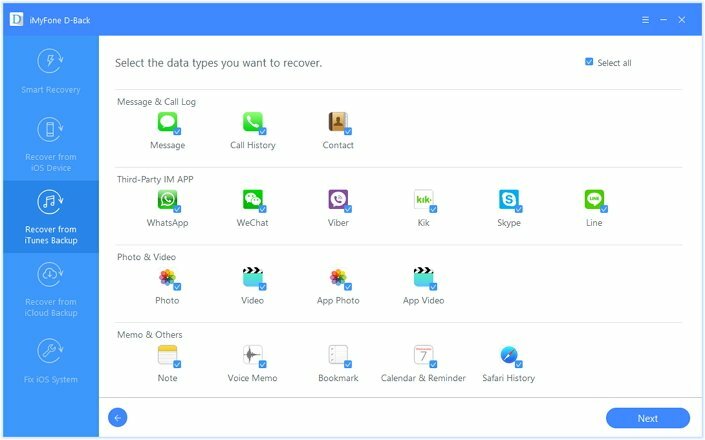 If you didn't make backup before and need to find a way to recover deleted photos without backup, a professional iPhone data recovery tool will be needed in this situation. Here I would like to introduce iMyFone D-Back as your recovery tool since it offers high data recovery chance, and it has been recommended by famous media sites like Cult of Mac, and Makeuseof. 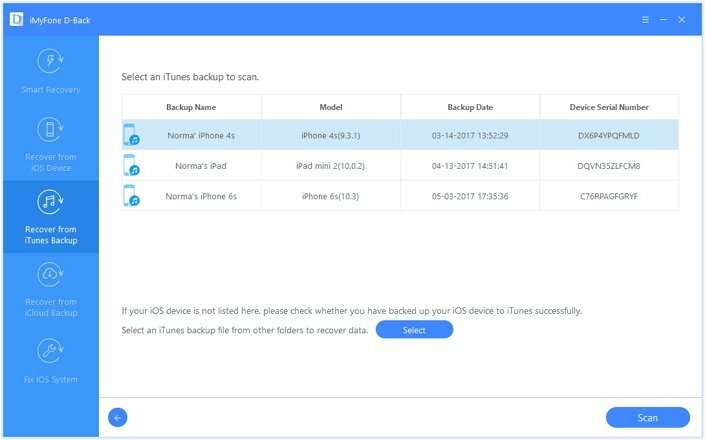 If you backed up your iPhone regularly to iCloud or iTunes, you can recover the deleted photos from the backup by restoring. It is not a perfect option because you will lose all the existing data on your iPhone. Also restoring is time-consuming. It is better to use a backup extraction tool to export the photos from iTunes or iCloud backup. Recover photos lost for various reasons including accidental deletion, jailbreak or iOS upgrade. 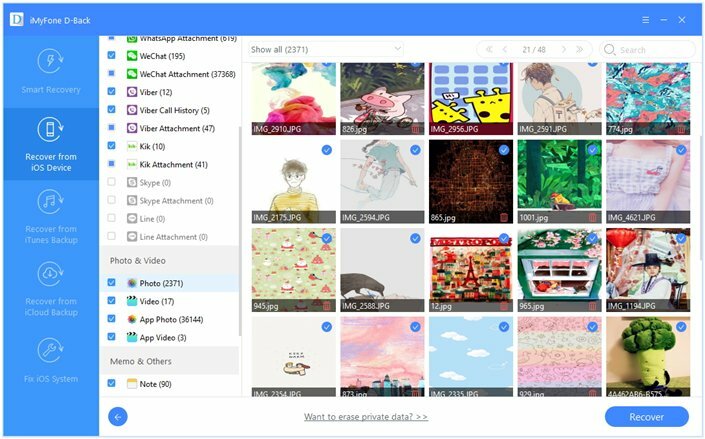 Directly scan your device and recover photos without backup. Also support data recovery from iTunes/iCloud backup. Supports recovering vidoes, text messages, contacts, voice memos, notes, messages from Kik/WhatsApp/WeChat etc. 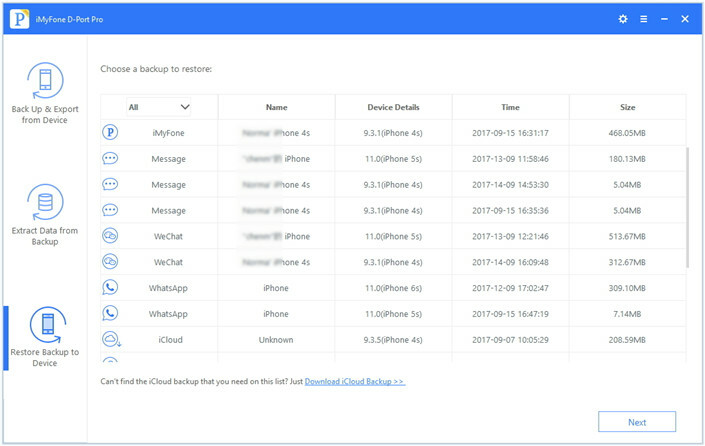 Extract 20+ types of data from iPhone or iPhone backup without changing present settings and data on iPhone. Compatible with iPhone XS/X/8/7 Plus/7/SE/6s Plus/6s/6/6 Plus/6/5s/5c/5/4s/4 running iOS 12/11.4/11/10/9/8/7. 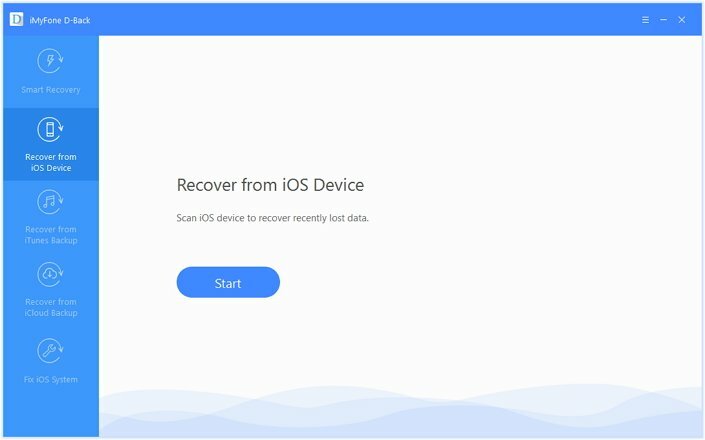 Download the Free Trial and run it on your computer and then follow these simple steps below to recover deleted pictures from the iPhone using 3 recovery modes of iMyFone D-Back. Step 1: From the main window, select "Recover from iOS Device". Click "Start" to continue. Step 2: Choose the file type "Photo" and click "Next" to continue. Step 3: Connect your iPhone to the computer and then click "Scan". Then the program will take a little while to scan you iPhone. Step 4: When scanning is finished, enable the button "Only Show the Deleted". Preview the pictures and select the ones you need. Then tap "Recover". The photos will be saved to the folder you have chosen as the storage path. However, if you cannot find the photos by scanning device, you can choose to restore from iTunes backup by doing below. Step 1: From the main window, select "Recover from iTunes Backup" and click "Start" to continue. In the next window, select "Photo" as the file type to recover and click "Next" to continue. Step 3: All the iTunes backup files available on that computer will be listed in the next window. Select the one that contains the missing photos and click "Scan." Step 4: Preview the results and choose the photos you want to recover and then click "Recover". Then the photos will be stored to the folder you choose on your computer. Step 1: Choose "Recover from iCloud Backup" from the main window and then click "Start" to begin. Then choose the typeof file you want to recover (in this case "Photo"). 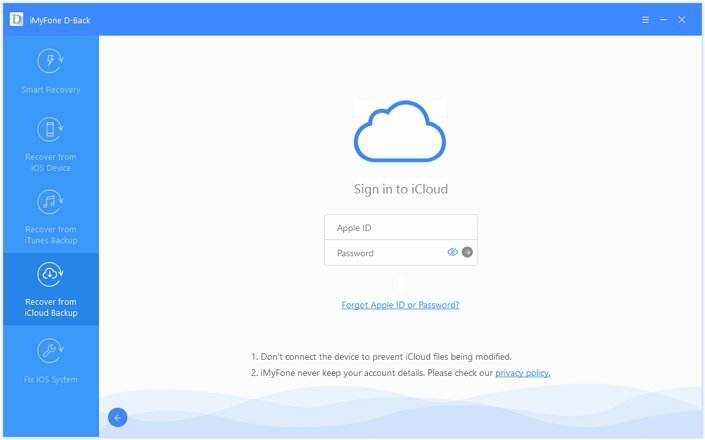 Step 3: Sign in to your iCloud account to allow the program to access the iCloud backup files on your account. iMyFone will not record your account information. Step 4: Select the iCloud backup file that contains the missing photos and then click "Next". Step 5: Wait for the scanning process to be completed (it shouldn't take too long) and then preview the results to select the deleted photos. Click "Recover" to save the recovered photos to your computer. 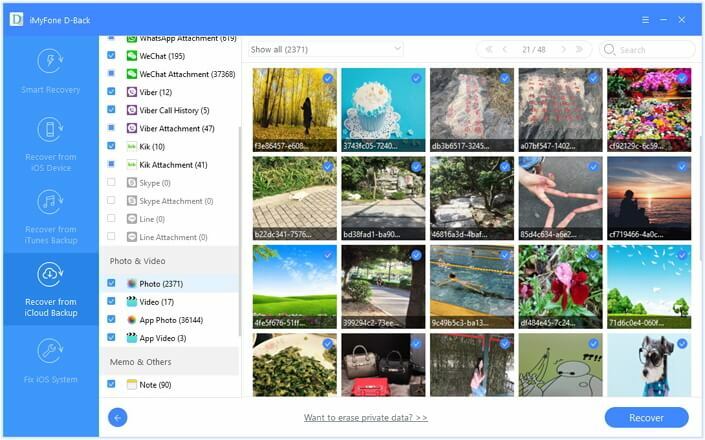 You can take advantage of the Free Trial for both Windows and Mac version of iMyFone D-Back and see if you can find your missing photos. It is compatible with iOS 12.1/12 now. Give it a try now! Sometimes, we delete pictures without realizing that just because we just don't like to keep so many pictures on our iPhone or just for bad mood. Therefore, your first step should be checking the "Recently Deleted" album to confirm whether the deleted pictures are there or not. This method works for those iPhone users who don't clean their "Recently Deleted" album often. Go to Photos > Recently Deleted, tap on the picture you need, then click "Recover" in the lower right corner to get it back to other albums. You can also select multiple pictures to recover by clicking "Select", tapping on more than one picture, and then click "Recover" and the selected pictures are back. I think lots of people are used to clear their "Recently Deleted" album, so this method may not work for most users. iTunes will back up your data every time you sync your iPhone with it. As long as you sync your iPhone with iTunes regularly, there is a large chance that you can recover the deleted photos on your iPhone from your iTunes' last backup file. Check out the instructions below. Step 2: Run your iTunes. 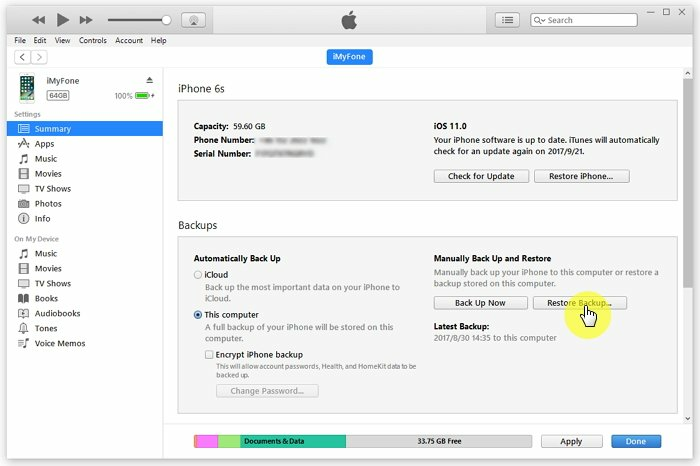 Click the iPhone icon, and choose "Restore Backup" from the Summary tab. You need pick an iTunes backup if you have more than one backup and then confirm it by clicking "Restore". Step 3: iTunes will start to restore the backup back to your iPhone. 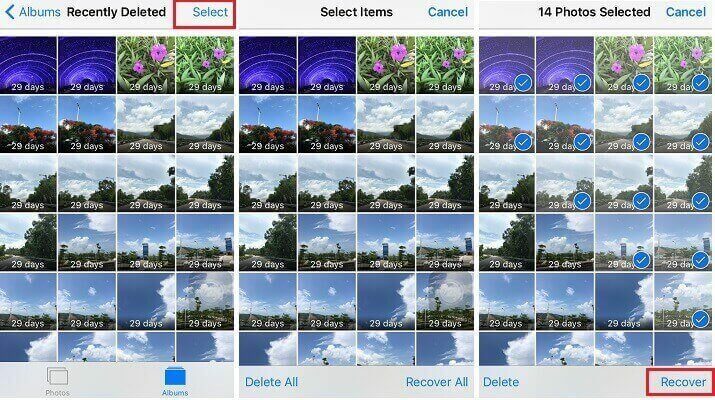 A few minutes later, you can check your iPhone to find the photos you deleted. You may lose part of the data if the iTunes backup is not up to date as iTunes backup will overwrite existing data on the device. To avoid this, you can try iMyfone D-Backup to restore from iTunes backup. If you have turned on iCloud Backup function from Settings > iCloud > iCloud Backup, then your iPhone can be backed up to iCloud auomatically when your iPhone is plugged in, locked and connected with Wi-Fi. Probably you deleted photos are in iCloud backup and you can restore them as below. Step 1: Go to Settings > General > Reset on your iPhone, then choose "Erase All Content and Settings." Step 2: From the apps Apps & Data interface, choose "Restore from iCloud Backup", then login your iCloud account. 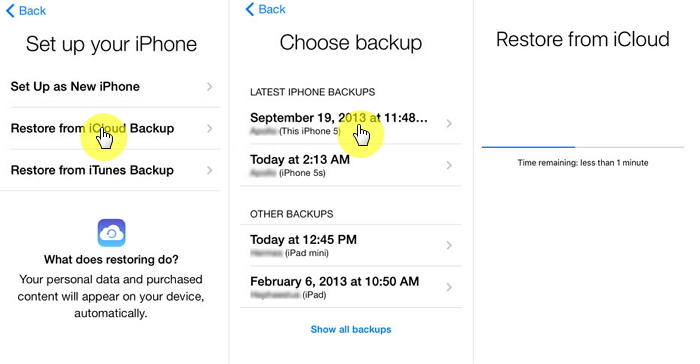 Step 3: Select a iCloud backup which includes the deleted iPhone photos from available backups in iCloud. Step 4: Follow the prompts to set up your iPhone as a new device. Similarly, iCloud restore will erase the data you haven't backed up yet. As the alternative solution, you might as well try iMyfone D-Backup to restore from iCloud backup. Both restoring from iTunes and iCloud are good methods to get your photos back, but you can't selectively recover data. In addition, the two methods could also overwrite the existing data on your device. You need make a backup before restoring, which is really time-consuming and there could be errors during the process. 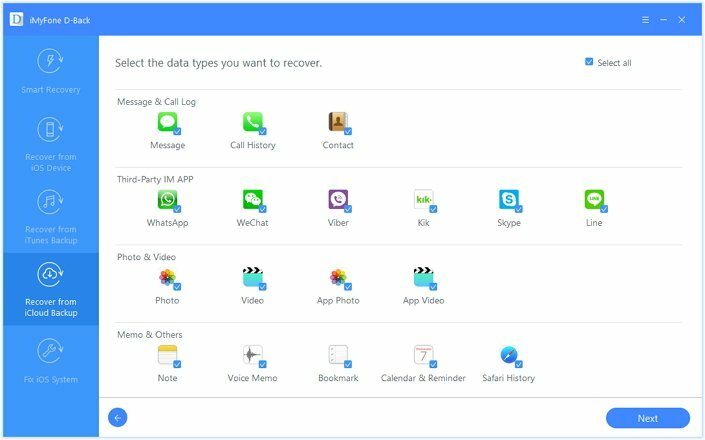 If you want to selectively recover data from either iTunes/iCloud backup files, iMyFone D-Port Pro can help. This is a flexible backup and restore tool. 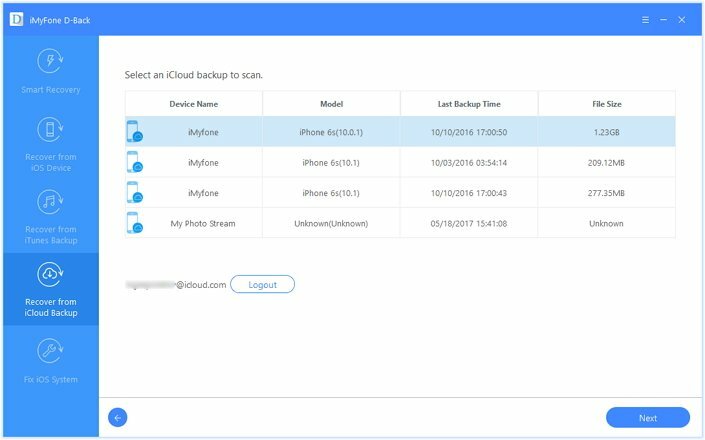 You can seperately backup certain type(s) of data on your device or restore particular type(s) of data from your iCloud or iTunes backup to you iPhone. It saves time and improve efficiency. If you don't want to restore the data to your device, you can also use it to extract the data from your backup to your computer. The only problem is that this is a new program and it now only supports to flexibly restore WeChat, Messages, and WhatsApp. More data types such as photos, contacts, notes, will be supported in the next version. This is the end of this article. I hope your deleted photos have been found. If you have any other good idea for recovering deleted photos from iPhone after iOS 12.1/12/11.4 update, please write a comment below and we will appreciate that. My mum’s iPod_Nano_Gen3 has just given up the ghost and she’s worried that she’ll lose the photo’s on there. Some of them are of people no longer around, so we must save them. Can you help? Thanks for your question. We are sorry to say that iMyfone D-Back doesn’t support recovery from iPod Nano at present. We will pass along your comment to our development team. Thanks a lot for your suggestion and sorry for the inconvenience. thank you for your useful tips. i downloaded imyfone dback and it detected my accidentally deleted messages! gorgeous! We are glad that the article is helpful for you, Jack. And yes iMyfone D-Back offers free trial version for users to confirm whether their data can be found. Thank you for your comment! Thanks a lot for your comment. Glad to hear that your deleted messages are found! Wish you have a nice day!